To follow up on the post that I scribble together at 3 am, undedited, the other day -A few grim thoughts for the New Year, as I reflect upon the past year, I want to refresh the memory of my readers, particularly in regards to why I was so bearish on many name brand banks last year. This may require some re-reading of the Asset Securitization series. So, before we get started on the major value drainers of 2009 (believe it or not, still mortgages, consumer and corporate loans) I want to provide a few links of interest that put things into perspective. The Asset Securitization Crisis Part 27: The Butterfly Effect: details leverage loan failure (ex-ibank risk), and The Butterfly is released! Yes, I know its a lot of reading, but that is why I have the confidence to short heavily into a rising market, and it is what has powered my returns thus far. Confidence in the fact that I have performed more comprehensive, more diligent, and more accurate research than those that I am selling shares to. Now, that we have caught up on the happenings of last year, let's look forward to what we can expect this year. After the subprime saga the asset securitization crisis unfolds another chapter up its sleeves with added melancholy, called the Option ARMs. With billions of Option ARMs due for recast in 2009 and 2010 another crisis is on the making. But this time problems are expected to be more pronounced than the subprime crisis since the economy is already nearing its trough, the consumer confidence has slumped to an all time recent history low and financial markets are in a gridlock. Making the matters worse is the unrelenting fall in the US housing market which is showing no signs of stabilization. 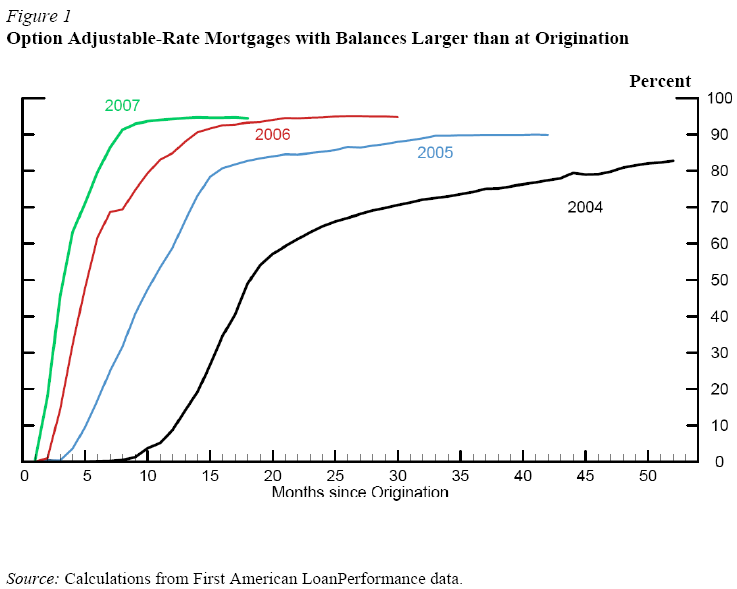 As seen in the tables below most of the subprime loans were scheduled to reset in 2007 and 2008 while most of Option ARMs are set to reset during 2009-2011. If Subprime loans are akin to "no documentation loans" then Option ARM could be rightly fit as "ballooning loans". Lenders made Option ARM with ‘teaser' features to borrowers which included making lower minimum payments for initial years and then loan being reset to higher payment schedule thereafter. If that was not enough these loans had another feature called "negative amortization". In plain vanilla language that would mean an actual increase in the principal of the loan itself, even after the borrower makes payments (due to the borrower opting to make a payment that doesn't cover full principal amortization). With US housing prices declining and the burgeoning loan-to-value skyrocketing, Option ARMs delinquencies are set to increase dramatically. Option ARM and its features: Unlike typical ARMs where the principal and interest or simple interest payment is calculated from an index (typically MTA) and margin, the Options ARM offers 4 payment options to choose from including - Minimum Monthly Payment, Interest-Only Payment, Fully Amortizing 30-Year Payment and Fully Amortizing 15-Year Payment. Typically Option ARMs allow the borrower to make a low monthly minimum payment for five years after which loan is recast which causes increased mortgage payment. However under the minimum monthly payment scheme, the difference between the minimum payment and the interest payment is added to the mortgage balance which could cause negative amortization. The negative amortization cap when reached (the balance of the mortgage grows to 110%-125% of the original balance) will cause the loan to be recast earlier. Growth of Option ARMs: According to LoanPerformance, option ARMs as a percentage of total ARM loan volume in non-subprime, non-agency securitizations increased from 12% in 2004 to 32% in 2005 and 42% in 2006 and was 40% in 2007. Some of the leading players issuing Option ARMs are BankUnited Financial, IndyMac, Wachovia, Washington Mutual, Countrywide, Downey Savings, FirstFed Financial and Guaranty Financial Group. However most of these banks including Wachovia, Washington Mutual, Countrywide and Downey Savings have either failed or being acquired by relatively larger players. Within the option ARM category, the 40 year Option ARM has witnessed a substantial increase reaching 38% of total Option ARMs in 2007 from 4% in 2004 since the longer term loans gained popularity because their lower initial payments and low-cost refinancing option. The 40-year Option ARMs not only have low teaser rates similar to 30 year ARMs but also have lower initial payments relative to the 30-year option ARMs due to the longer amortization term. This "double-teaser" feature of the 40-year option ARMs causes higher payment shock and could cause faster negative amortization than 30-year option ARMs. The potential average payment increase on the loans recast is 63%, representing an additional $1,053 due each month on top of the current average payment of $1,672. These large payment increases could cause delinquencies to increase, and increase dramatically, after the recast. The fact that only 65% of borrowers have elected (or are able) to make only minimum payments underscores the magnitude of the potential problem. The potential payment shock combined with the continuous deteriorating outlook for home prices and lack of refinancing opportunities could be a negative cause of concern for investors in Option ARM securities. Even more ominous, is pall cast upon the banks that hold these assets and are additionally exposed to other forms of consumer credit, ie. HELOCs, credit card debt and other unsecured loans (remember the links from the Asset Securitization Crisis above). Fitch report titled "Option ARMs: It's Later Than It Seems" dated September 2008. [quote]As you will recall, the Gold Act, or more properly Executive Order 6102 of April 5, 1933, required Americans to surrender their gold coinage and certificates to the Federal Reserve Banks by May 1, 1933. There were no prosecutions for non-compliance except one benchmark case which was brought voluntarily by a person who wished to challenge the act in court. After a substantial portion of the gold was turned in by US citizens and taken from their bank based safe deposit boxes, the government officially devalued the dollar from 20.67 to 35.00 per ounce in the Gold Reserve Act of January 31, 1934. The proceeds from this devaluation were used to provide a significant boost to the Federal Reserve member bank positions as shown in the first chart below. The inflation visited on the American people because of this action helped to take the CPI as it was then measured up 1200 basis points from about -8% to +4% by the end of 1933. To somewhat offset the monetary inflation the Fed also contracted the Monetary Base which served the nascent recovery in the real economy rather poorly and is viewed widely as one of a series of policy errors. [quote]The financial crisis has claimed its first two banks in 2009 at an approximate cost to the FDIC of more than $200 million. The Federal Deposit Insurance Corp. announced Friday that the National Bank of Commerce in Berkeley, Ill., and Bank of Clark County in Vancouver, Wash., had been shuttered. Bank of Clark County was the first bank in Washington state to fail since 1993. The fed is doing everything it can to prop up zombie institutions-with the taxpayers getting scr@@wd in the process. Buying the toxic assets is one of those things. But there is so much of the sh@t out there that the Fed has a formidable task on its hands. The healthy banks (look among the smaller banks) without the cr@p should be able to coin money over the next few years given the steep yield curve. Buy them when Citi goes back to the troth, and JPM too. Aren't the option ARMs going to be the toxic assets targeted buy 500 billion Fed program? Some think that with interest rates so low that option-ARM resets will not be so bad, however with so many option-ARM home debtors making only the minimum payments and thus increasing their underwater status month by month, this will be bigger than sub-prime. Thanks for the review and looking forward to your thoughts, Reggie. OptionARMS really made/make sense for those who earn a large portion of their income through a bonus (or other) structure that pays on less-than-monthly basis (eg annually or quarterly) and have the discipline to manage that type of payment cycle. So in a way OptionARMS have become an example of unintended consequences as they were widely issued way beyond that market. By late next year some big banks will realize ample profits on the damaged assets they wrote down so severelyâ€”the mortgage-backed securities, collateralized debt obligations and other arcane weapons of their own destruction. ur opinion on this ?